The antithesis of transit-oriented development. 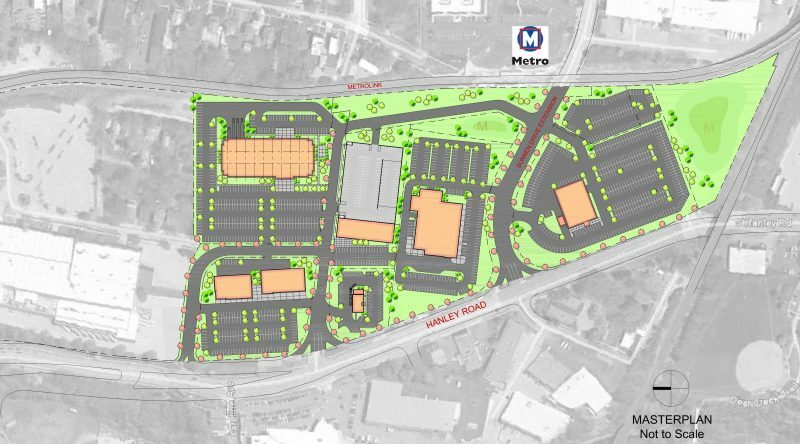 That’s what I called the plan for the site adjacent to the Sunnen MetroLink station that is currently under construction, a Mini car dealership surrounded by more than 500 parking spaces. Then I found this image and description on Cozad Commercial Real Estate’s website which shows the next phase of development. Sunnen Station Masterplan // Cozad Commercial Real Estate. Sunnen’s goals for Sunnen Station are to establish a master plan that will allow for future growth, development and adaptability to change in our constantly changing real estate market; as well as promote the lifestyle of the development, including access to transit, greenways and an urban mix of uses as a highly desirable place to work. “access to transit”? The whole site is currently a big swath of inaccessible dirt. I don’t take Metrolink regularly, but if I did I’d be extra pissed because currently it is not possible to walk to the Sunnen station from the south or west. One has to walk all the way north to the Maplewood station. As it is I avoided using the train for a concert recently. An email to Cozad and Maplewood got no response. Metro said they’d bug them, at least. When any development becomes welcomed development in Maplewood, then they might as well become unincorporated. Afterall, this is a product of their local planning, which lacks distinction from any other place. been at Big Bend, closer to many residences and a good transfer point for buses. of way through the property.